Next year, I should imagine that the Dutch National Bitcoin Congress will be renamed the Dutch National Blockchain Congress, since that’s pretty much all everyone was talking about this year. Me included. I had a lovely day at the Congress. 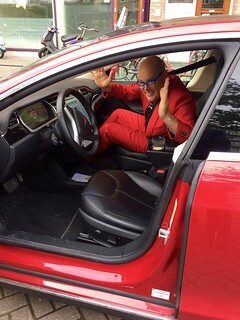 In the morning, Vicente Everts arrived with his Tesla for me to drive across to the the ING Headquarters, where the bank were hosting the event. 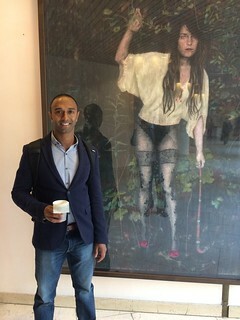 Once we arrived at the HQ and parked up, Jeremy Bonney and I set about admiring some of the rather unusual works of art in their rather unusual building. 1CP it is not. 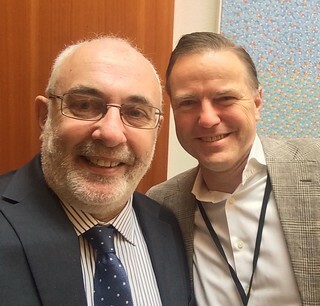 Once we arrived at the conference centre, I ran into old friend Douwe Lycklama from Innopay and I got down the serious business of working on a soundbite for the day. I came up with “The future of money isn’t Bitcoin and the future of Bitcoin isn’t money”. It’s a bonus if your soundbite can fit into 140 characters, for obvious reasons, so I thought this was a good day’s work. It was successful beyond my wildest dreams and is still being retweeted. As it turned out, I had accidentally blundered into the Congress’ key meme. I settled down in the audience, in the special seats at the front reserved for payments VIPs of course, and found myself next to Conny Dorrestijn from our friend at Clear2Pay, which was handy as I don’t speak any Dutch, and she speaks it pretty well. And so began an excellent Congress. Great speakers, great panels and a great host. I genuinely felt that I learned something from every session and I honestly can’t say that about every single event that I get to go to. One of the things I learned was that no-one was much interested in talking about Bitcoin. 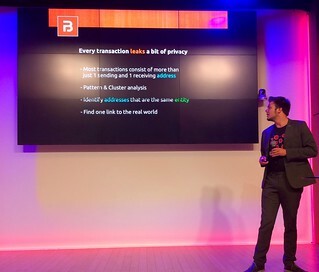 In a sold-out room packed with suits, the Dutch financial sector gathered to discuss blockchain technology, smart contracts, digital title deeds and shared supply chains — anything but the decentralized, stateless, bankless, community-driven digital currency. They even avoided the word “Bitcoin,” as if it were cursed. “The B-word” was the term du jour. Vicente drove the day along at a decent pace and asked interesting questions to interesting people and (a key qualification for a host, in my opinion) was genuinely interested in what they said. 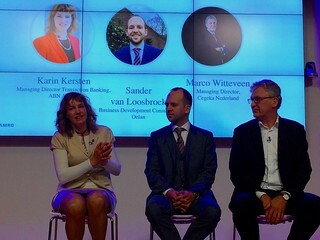 Just to give you an example of the sort of things that were discussed instead of Bitcoin, in the brilliant first panel ABN Amro were talking about their pilot project to move trade finance instruments on to a blockchain. It was great to hear honest and open discussion about this whole new area of business with people who had practical perspectives. Actually, it wasn’t quite right to say that no-one mentioned Bitcoin, of course they did, even though the rhetoric was to my mind far less “religious” that I was familiar with from previous events. That’s not to say that the idea of Bitcoin as a revolution in the story of money had vanished. 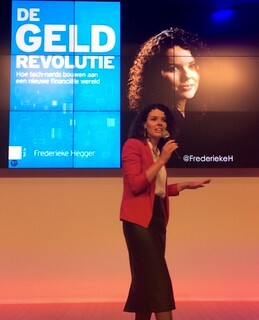 One of the presenters was the RTLZ journalist Frederieke Hegger who happens to be writing a book on the topic. I’ll be very interested to see how it turns out although of course I will need Conny to read it to me. There was an embarrassing incident in the middle of day. I’d been blathering on to all and sundry about how Bitcoin wasn’t money. 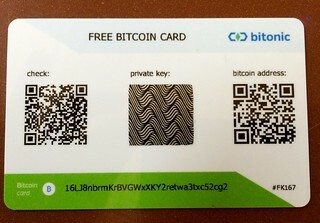 But when the nice people at bitonic (use your iDeal to get Bitcoin here!) starting giving out free Bitcoins I was so excited that I tweeted about “free money”. Hoist by my own petard. OK, so it isn’t money it’s some weird kind of tradable commodity or something. But nevertheless, if they are giving it out free, I’ll have some. There were a few presentations that I’m still thinking about now. 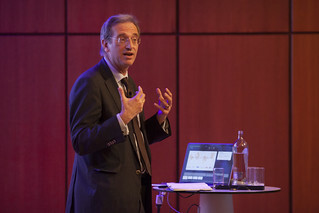 Lex Hoogduin gave a measured and thoughtful talk about money which pandered to my neo-Hayekian perspectives on private money. 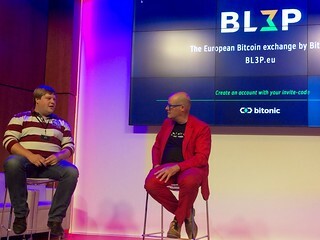 Ruben de Vries from Blocktrail was thought-provoking around issues dear to my heart. I rather liked his formulation about transactions leaking a bit of privacy. 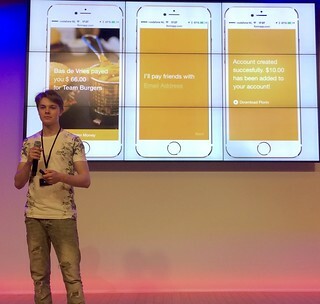 Bas de Vries gave a nice pitch for FlorinApp which resulted in him being offered a job at a bank live on stage (he said no, by the way). I greatly resented his youth and energy and I’ve asked the organisers to insist on a minimum age of 21 for all presenters next year. However, in the end the best presentation I saw came from Fidor Bank. 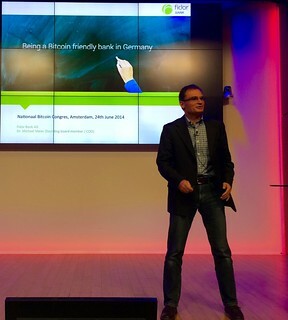 Fidor fascinates me because, as I come from the technology side of things, they have chosen to build their bank on a fundamentally different core banking architecture. The FidorOS, the “amazonisation” of banking systems and the customer community are all new ways of delivering services. And Michael Maier is a great presenter. I added my own minor contribution to the day by focussing on blockchain applications. I tried to create a narrative thrust using “the glass bank” as the backdrop and then working though transparency and shared ledgers to get to the blockchain itself. I then recycled some blockchain applications that I’d heard about in different contexts and asked the audience to indicate which ones they believed in. The slides are online if you want to see them. 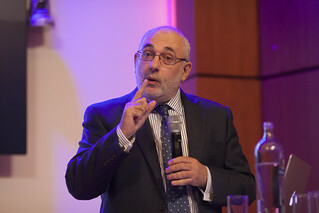 If you feel like killing some time, the whole event was filmed and you can see the video on the home page (my talk starts about two hours in if you want to see the audience responses for yourself). My conclusion for the day is that people who say that shared ledgers will transform financial services are probably right but the people who say that the Bitcoin blockchain will do so might well be wrong. It was not at all obvious to me at the end of the day that the computational expense of the Bitcoin blockchain makes it the best implementation of shared ledger when working within reputation groups (i.e., financial services). It was designed to meet a very specific set of requirements to do with “cash”. It’s like the first steam engine that was designed to pump water out of mines. People didn’t put that steam engine on rails and start shuttling miserable hordes from Woking to Waterloo. It was a steam engine, yes, but it wasn’t that steam engine. It was a steam engine with a rotary converter and a governor and so on (and I think we’re still waiting to see what that sort of blockchain might look like. The crucial improvement to the steam engine was the Boulton and Watt separate condenser. What is the equivalent for the blockchain? Ethereum? Maybe. Hawk? Maybe. I open to suggestions. Perhaps a software metaphor like Multics, UNIX, BSD, Linux, Darwin is a better choice than the steam engine. I think what gets lost in the Bitcoin vs Blockchain discussion is that ultimately it’s about network effects of a particular ecosystem. Yes Bitcoin the currency/network itself may very likely be only suitable for bearer-type censorship-resistant tokens, but there are emerging private solution providers (MultiChain, BitPay ChainDB, CryptoCorp, etc.) that companies in the Bitcoin ecosystem can instantly plug into (exchange, wallets, APIs, etc. ), and that customers can leverage. Companies can build on one, deploy on another, or both. Cross-chain interoperability is key as well for network effects. An Internet of Chains without cryptographic cross-chain linking à la sidechain is like a Web without the hyperlink. So IMHO the wrong debate is: Permissioned vs permissionless, Bitcoin vs Blockchain. The right debate is: what are the top emerging ecosystems & which most likely to offer both and more. Because Blockchain is not an ecosystem, I won’t wager that every conference will be renamed Blockchain something by next year, I think it’s more likely that ecosystem brands will dominate: Bitcoin, Ethereum, Ripple, etc. Also it is quite likely that each ecosystem will initially find a niche and win in particular industry segments. For instance (but I have little idea), Ethereum for IoT, Ripple for retail banking, Bitcoin for tradeable financial instruments or gaming. Yes I like the idea of different chains for different niches, but I think a lot of those niches will use non-chain technology for shared ledger implementations. So in Feb 2014 I remember banging the drum about “the real value is in the technology”, but the narrative has now swung so far that people are seeing no utility in Bitcoin at all. I disagree with this assessment. If you want a permanent record that is censorship resistant, it’s the best solution on the planet to date, still. Where censorship resistance is not desireable (like say China, or a charter for snooper types), then you’re probably not going to want something quite so transparent, but you may like the reconciliation by cryptography between multiple disparate actors. I get that reconciliation by cryptography feels a lot more tangible and investable. It’s like intranet, we had to have organisations build their own networks, before we could internet-work them together. That’s when the standards around “a blockchain” or “a distributed ledger” become “The Blockchain” proper noun, in the same way “The Internet” is a proper noun, but no such thing actually exists. I know, I know, the designers were suppose to fix the names thing this week. Will chase on Monday.